By Rodolfo Santullo. Translated by Will Carne. The white paint fell in thick, round droplets, so large that they gave a faint reflection of George’s face. He ran the paintbrush over the wall and eyed the results with dissatisfaction, noting that the drops of paint trickling down the wall were as many as the beads of sweat on his forehead. Beside him, Beatrice, his wife, took care of the panelling and the more detailed work. She glanced sideways at what her husband was doing and sighed, annoyed. “If you do it like that it will be full of lumps,” she exclaimed, turning back to her work. “They’ll be covered up by the second coat,” replied George in the same tone. They had been that way the whole morning. She was angry because she was painting a house she would not even want to see a photo of, stuck out in the middle of the desert, more than an hour away from the nearest signs of civilization. He was angry because she was wearing nothing but a bikini top and a pair of cut-off jeans, and as he watched the fine drops of perspiration running between her breasts, he had to stifle the surge of desire welling up inside him from the pit of his stomach. George stepped back from the wall for a moment and took a Coca-Cola from a portable cooler. Only then did he notice Betty theatrically approaching the room, walking with the clumsy steps of her one and a half years of age, wearing only a nappy. Her body was covered in sweat. The girl looked at her father a moment and squealed something incomprehensible. Then the weight of her own body became too much for her legs. She fell, and landing on her nappy she sat there babbling. “Are you hot, sweetie?” asked George, smiling. The baby burbled a meaningless reply and made several unsuccessful attempts to stand up. Her father turned round and got back to work. Beatrice looked at the drink in his hand and then at the girl, still trying to stand. The response that George never managed to give was interrupted by the sound of a distant scream. A muffled cry, barely human. A desperate howl of pain and sorrow in the silence of the desert. The sound of despair. They stood motionless. Even the baby stopped trying to lift herself up and raised her head in surprise. There was a moment of silence, in which they half expected to hear the sound repeated or echoed, if only to confirm that it had been something real. Then Betty began to cry. Beatrice took the young girl in her arms and held her tight against her chest. Even then, the baby would not stop screaming. “Do you think someone needs help?” George stood still, the paintbrush in one hand, the can of coke in the other. Drops of paint and condensation from the can fell to the ground, forming a soggy centimetre and a half of white liquid. Beatrice made no reply. The couple went out to the patio where the red tiles fought a fruitless battle with the sand. They looked out to the horizon, as if expecting to hear something else. The sun reflected off everything, especially the chrome pick-up, which had become almost incandescent in the sunlight. Half-blinded, they searched for the source of the cry. “There!” shouted George, pointing to a flock of vultures circling on the horizon. He started to move towards the truck, but Beatrice, who was still struggling to comfort the child, held out a hand to stop him. “You’re not going to leave us alone!” she shouted, her eyes wide with fear. George hesitated. “But…maybe someone is injured…or unconscious,” he exclaimed, but his wife shook her head. “We can all go together in the truck…” he insisted, eyeing the sinister black shadow hovering over the desert. But Beatrice still refused. “It must have been an animal…” she said then. Betty had quietened down and was watching everything with a look of fear from between her mother’s arms. “It didn’t sound like any animal, Beatrice, someone may need help…” protested George. On the horizon, a vulture made a turn in the air and dipped low. Its companions squawked clamorously, shattering the silence of the desert in an unbearable cacophony. The baby started to cry again. “Do whatever you want” Beatrice said, shrugging her shoulders as she went back into the house. George watched her for a moment, before turning again to face the desert. 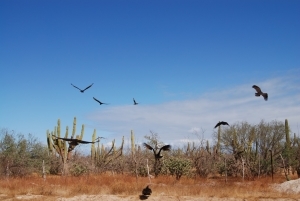 The vultures were dropping to the ground one after another in a peculiar, macabre dance. George stood there motionless, staring vacantly, leaning against the truck until the scorching metal burned him. When he could no longer bear the sun, he went back into the house. The mirror was in a terrible condition. On one side, rust was beginning to eat into it, making the reflective surface unsightly and almost useless. George peered at his own clean-shaven face. He ran his fingertips over the top of his upper lip, discovering a small patch that was still rough with stubble. He sighed, intent on his own reflection, on the dark circles and signs of fatigue, the result of the previous night’s insomnia. Resigned, he began to brush his teeth. As he spat out the mixture of water, toothpaste, saliva, and a trickle of blood from a swollen gum, Beatrice appeared at the bathroom door. She had also slept badly that night. The baby had woken up constantly and only her mother could settle her. Beatrice looked at him impassively from the doorway. She made no reply. She just watched him, silently, for the space of half a minute. When he finished rinsing out his mouth, she told him. The effect that these words had on George was like a hammer blow. He staggered for a moment, holding himself upright against the basin where a cloudy jet of water ran weakly from the tap. Then he blinked incredulously for a moment before racing outside, his wife following slowly behind. The pick-up really wasn’t there. George, shielding his eyes with one hand, examined the beige-yellow ground. He was looking for tracks, marks in the sand to show that the vehicle had been stolen, but there was nothing. There was no trace of the car moving over the sand, either driven by its engine or being pushed. Nothing. “I didn’t hear anything last night…” he murmured, without looking at his wife. “Me neither… and I was wide awake,” replied Beatrice from the doorway. The truck had disappeared. It had evaporated. Inside the house, Betty began to cry. She had woken up. Beatrice looked at George a moment longer. Without knowing why, he lowered his head, unable to meet her gaze. She went back inside the house. The vultures had disappeared. The horizon was clear; nothing broke the monotony of the desert. George’s gaze lost itself in the rising and falling of the dunes and in the small track of red earth that served as a route from the house to the main road. Nothing moved. Everything was static in that still, breezeless morning. The sun hung fiercely over the small unfinished house and its inhabitants. George took a few clumsy steps forward, towards the desert. He felt small, powerless. He felt the house shrinking into the distance behind him. He turned back, frightened, as if the umbilical cord that still joined him to his own sanity had been stretched to its limits. Inside the house, the baby was still crying. George wanted to cry too, although he didn’t know why; although he didn’t even understand what was happening. He stopped at the front door and waited. Something had to happen. A short cawing broke the silence. The vultures were still there. Not within eyesight, but there they were. Almost running, George entered the house. George had spread the various objects necessary for the walk to the nearest town on the table, completely covering it. Sunhats for himself and Beatrice, the baby holster for carrying Betty, several bottles of mineral water and lastly, a long, heavy hammer. He added a white, almost transparent tulle to cover the baby and a couple of packets of bran biscuits, remnants of the supplies left in the kitchen cupboard. At that moment, Beatrice came into the room. “I don’t know if I want to go,” she exclaimed. George looked at her for a moment, then continued packing the things. “We already talked about this…” he replied, “if you want… you stay here with Betty, lock yourselves in and wait for me. But I’d prefer you to come with me. It’s three hours’ journey at most”. They stood facing each other in silence. For Beatrice, the idea of leaving posed an even greater risk; for George, to leave behind his family was impossible. But something had to be done, that much was obvious. The connection between the events of the previous day and this morning, the scream and the disappearance of the truck: there was no way they could be isolated incidents. Without understanding why, they knew they were in danger. “Let’s all go,” she nodded. “I hope she doesn’t start crying again…” sighed Beatrice. “She’s been so calm lately… she hasn’t cried or anything,” smiled George. His wife disappeared into the bedroom while he put the loose items in a small backpack, which Beatrice would carry. He tucked the hammer into his belt. Truthfully, he didn’t know if he was capable of wielding it to defend himself, but holding it gave him some sense of security. The hammer slipped from his belt and landed on the limestone floor with a dull thud. The cry, heartbroken and piercing, hung in the air for ten long seconds. When it stopped, George finally reacted, running up to the bedroom. Beatrice was kneeling on the floor, her mouth open and her eyes bulging out of their sockets. She was fixed in a mute scream, her throat stifled, her voice frozen. In front of her, the crib was empty. “Where is she?” shouted George. But Beatrice only rocked back and forth, petrified and mute. Hesitantly, George moved through the locked room. There was too little space not to see the baby. There was nowhere she could be hidden. “Betty?” George stammered, feeling his legs give way beneath him. Each cry was stronger than the last; the words lost their meaning until they were only a guttural, primal scream. George could stand it no longer. He held his head in both hands and ran out the room, covering his ears. He ran until the sand came up to his knees. There he collapsed under the sun, the small, helpless house behind him. The terracotta tiles of the courtyard. The path, a similar shade of red, that at one time was supposed to reach the road. Where there once used to be some means of return to civilization. The zinc roof. The limestone floor. The windows empty of glass, covered only by peeling wooden shutters. The empty house. Every grain of sand is different but at the same time they are all alike. Each one becomes identical, but they know themselves to be different. Their sizes, shapes, even their contents may be the same, but on an intimate level each one of them knows themselves to be an individual. At the same time, however, they understand that they are part of something. Different, but the same. George’s face sank into the sand. Sprawled out on the sand for however long, he felt himself sinking slowly, almost imperceptibly, into that yellow sea, which caught the sunlight like shimmering crystals. His hands open, his palms flat on the hot ground. His body, crushed by pressure and by guilt. His eyes already dry, without tears. His mind empty. He began to crawl again. He didn’t know where to or why he kept going. All that remained was an elemental understanding that he must continue onwards, ever onwards. A thread of saliva escaped from the corner of his mouth and mixed itself with the sand. His mouth, open and panting, had lost for ever the ability to articulate a single word. He was not surprised to notice the shadows passing over him. Eclipsing momentarily the perpetual sun, the vultures glided over their prey. It was still moving, and they were not stupid. If the prey can move, it can still defend itself. They do not hunt. They just take advantage of whatever is left behind. George turned over and lay on his back. He watched them turning, making loops in the air, incomprehensible. He heard them cawing in their own language, more ancient than words or form. Devoid of content, but meaning everything. He watched them for seconds, minutes, maybe hours. Patiently, their numbers steadily increased. Until they covered the whole sky. And all he could do was scream. A muffled cry, barely human. A desperate howl of pain and sorrow in the silence of the desert. The sound of despair. One after another, the vultures dropped down onto their prey. La pintura blanca corría convertida en gotas gruesas, espesas, tan grandes que reflejaban vagamente el rostro de Jorge. Contempló disconforme el resultado de pasar la brocha de pintura, y calculó que eran tantas las gotas que corrían por la pared como las de sudor por su frente. A su lado, Beatriz, su mujer, se encargaba de los marcos y del trabajo fino. Miró de reojo lo que estaba haciendo su marido y resopló, disgustada. —Así queda lleno de grumos —exclamó, concentrada otra vez. —Se van en la segunda mano —respondió en el mismo tono Jorge. Habían estado así toda la mañana. El enojo de ella se debía a estar pintando una casa que no quería ver ni en fotos, perdida en el medio del desierto, a más de una hora de cualquier civilización. El enojo de él se debía a que ella solo vestía un bikini y vaqueros cortados, y contemplando las finas gotas de transpiración que le corrían entre los senos, tenía que ahogar el impulso del deseo que le apremiaba en la boca del estómago. Jorge se retiró un momento de la pared y tomó una Coca-Cola de una heladerita portátil. Recién entonces notó a Betty, que pomposamente se acercaba al cuarto, caminando con los pasos torpes de su año y medio de edad, cubierta únicamente con un pañal. Su cuerpo estaba cubierto por sudor. La niña miró a su padre un momento y exclamó algo incomprensible. Luego, su propio peso fue demasiado para sus piernas y cayó sobre el pañal quedando sentada y farfullando. —¿Calor, gordita? —preguntó Jorge, sonriéndole. La bebé contestó algo que sonó a chino, mientras hacía inútiles intentos por levantarse. Su padre se giró y volvió al trabajo. Beatriz miró el refresco en su mano y a la niña que aún no conseguía ponerse de pie. —Podrías haberme traído una —protestó la mujer—, y podrías prestarle atención a tu hija, para variar. La réplica que Jorge nunca alcanzó a proferir, se vio interrumpida por un lejano grito. Un grito sordo, apenas humano. Un desesperado aullido de pena y dolor en el silencio del desierto. La desesperación hecha sonido. Quedaron inmóviles. Incluso la bebé, que desistió de levantarse y alzó sorprendida la cabeza. Hubo un instante de silencio, donde esperaban la repetición o eco del sonido, para confirmar que había sido algo real. Entonces Betty empezó a llorar. —¡Por Dios!—exclamó Jorge—. ¿Qué fue eso? Beatriz levantó en brazos a la niña y la pegó a su pecho. Ni aun así, la bebé dejó de chillar. —No sé… —respondió—. Ya… ya… nena, ya pasó. —¿Alguien precisará ayuda? —Jorge permanecía quieto, la brocha en una mano, la lata de Coca-Cola en la otra. Las gotas, tanto de pintura como del sudor del refresco, caían al suelo, formando un pastoso centímetro y medio de líquido blanco. Beatriz no contestó. La pareja salió al patio, donde las lozas rojas combatían infructuosamente con la arena. Miraron al horizonte, como esperando escuchar algo de nuevo. El sol relucía en todo el lugar, especialmente en la Pick-Up cromada que se volvía casi incandescente. Cegados, buscaron el origen del grito. —¡Allí! —gritó Jorge, señalando una bandada de buitres que revoloteaba en el horizonte. El hombre hizo un ademán de dirigirse a la camioneta, pero una mano de Beatriz, quien todavía pugnaba por tranquilizar a la niña, lo detuvo. —¡No nos vas a dejar solas! —chilló, los ojos dilatados por el miedo. Jorge vaciló. —Pero… puede haber alguien herido… o inconsciente —exclamó, mas su esposa negaba con la cabeza. —También podemos ir todos en la camioneta… —insistió él, mirando la siniestra sombra negra que sobrevolaba el desierto. Pero Beatriz seguía negando. —Debe haber sido un animal… —dijo ella entonces. Betty se había callado y miraba todo asustada, entre los brazos de su madre. —No sonó a un animal, Beatriz, alguien puede precisar ayuda… —protestó Jorge. En el horizonte, un buitre realizó un giro en el aire y se dejó caer. Sus congéneres graznaron estruendosamente, transformando el silencio del desierto en una cacofonía insoportable. La bebé comenzó a llorar nuevamente. —Hacé lo que quieras —se encogió de hombros Beatriz mientras entraba en la casa. Jorge la contempló un momento, y se giró nuevamente, de cara al desierto. Los buitres se dejaban caer a tierra uno tras otro, realizando un singular y macabro baile. Jorge se quedó allí, inmóvil, la mirada perdida, apoyado en la camioneta, hasta que el metal caliente lo quemó. Cuando no resistió más el sol, entró en la casa. El espejo estaba descascarado. En uno de sus lados, el óxido había empezado a comérselo, lo que convertía a esa superficie reflectante en un adefesio bastante difícil de utilizar. Jorge contemplaba su rostro recién afeitado. Pasó la yema de los dedos por encima del labio superior, descubriendo medio labio aún áspero por la barba. Suspiró, concentrado en su propio reflejo, en las ojeras y marcas de cansancio, producto de una pasada noche de insomnio. Resignado, comenzó a cepillarse los dientes. Cuando escupía esa mezcla de agua, pasta de dientes y saliva, además de un hilillo de sangre de una encía casi tumefacta, Beatriz apareció en la puerta del baño. También ella había pasado una mala noche. La bebé se había despertado constantemente y solo su madre podía calmarla. Beatriz lo miró inexpresiva desde el resquicio de la puerta. —Hoy nos vamos al pueblo, —exclamó Jorge, con la boca aún llena de pasta—, informamos del grito y los buitres. Después vos y la nena se van para casa, yo vuelvo a trabajar y termino todo por acá. Ella no respondió. Se limitó a mirarlo, silenciosa, por espacio de medio minuto. Cuando él terminaba de enjuagarse la boca, lo dijo. —La camioneta ya no está. Las palabras produjeron un efecto en Jorge similar a un martillazo. Se tambaleó un momento, asiéndose a la pileta por donde corría débilmente un chorro de agua casi turbia. Luego, parpadeó incrédulo un instante, para lanzarse a la carrera hasta afuera, seguido lentamente por su mujer. Efectivamente, la Pick-Up ya no estaba. Jorge, haciéndose visera con una mano sobre los ojos, examinó el terreno beige y amarillo. Buscaba huellas, marcas en la arena que certificaran el robo del vehículo, mas no había nada. No había rastros de un avance del coche sobre la arena, ni impulsado por su motor o empujado. Nada. —Yo no escuché nada anoche… —murmuró él, sin mirar a su esposa. —Yo tampoco… y estaba bien despierta —replicó Beatriz desde el resquicio de la puerta. La camioneta había desaparecido. Se había evaporado. Dentro de la casa, Betty comenzó a llorar. Se había despertado. Beatriz miró un momento más a Jorge, y este, sin saber por qué, bajó la cabeza y no le sostuvo la mirada. Ella entró en la casa. Los buitres habían desaparecido. El horizonte estaba limpio y nada rompía la monotonía del desierto. La mirada de Jorge se perdió entre los altibajos de las dunas, y en el pequeño sendero de tierra roja que oficiaba de salida desde la casa hasta la carretera. Nada se movía. Todo permanecía estático en esa mañana sin brisa. El sol se cernía, inclemente, sobre la pequeña casa en construcción y sus habitantes. Jorge realizó un corto avance, con pasos torpes, hacia el desierto. Se sentía pequeño, impotente. Sintió la casa achicarse en la distancia, a sus espaldas. Retrocedió, asustado, como si el cordón umbilical que aún lo unía a la cordura se hubiera tensado hasta su límite. Dentro de la casa, la niña aún lloraba. Jorge tuvo ganas de llorar también, aún sin saber por qué, aún sin comprender qué ocurría. Se detuvo en la puerta de la casa y esperó. Algo tenía que suceder. Un corto graznido rompió el silencio. Los buitres aún estaban allí. No a la vista, pero allí estaban. Casi corriendo, Jorge entró en la casa. Ocupando completamente la mesa, Jorge había desparramado la serie de objetos necesarios para la caminata hasta el pueblo más cercano. Sombreros para él y Beatriz, la mochila para bebés, donde llevaría a Betty sobre el pecho, varias botellas de agua mineral y, por último, un martillo largo y pesado. Agregó un tul blanco casi transparente para tapar a la bebé y un par de paquetes de galletas de salvado, lo que quedaba de provisiones en la alacena. En ese momento, entró Beatriz en el cuarto. —No sé si quiero ir —exclamó. Jorge la miró un instante, luego siguió acomodando las cosas. —Ya lo hablamos… —respondió— si querés… te quedás acá con Betty, trancan todo y me esperan. Pero yo prefiero que vengan conmigo. No son más que tres horas de camino. —Sí… pero acá está la casa, no sé… me siento más segura acá. —¿Quién va a venir? Dijimos que estaríamos acá todo el mes. —¿Se van a dar cuenta que no volvemos? Para eso tiene que pasar mucho tiempo… y eso si nos recuerdan. Se quedaron mirando en silencio. Para Beatriz la idea de partir entrañaba más riesgos todavía, para Jorge irse dejando atrás a su familia se volvía imposible. Pero algo debía hacerse, era evidente. La unión entre los sucesos del pasado día y esta mañana, el grito y la desaparición de la camioneta, no podían ser hechos aislados entre sí. Sin entender por qué, se sabían en peligro. —Vamos todos —asintió con un gesto. —Muy bien —convino Jorge— traé a la nena… y nos vamos de una buena vez. —Espero que no llore de nuevo… —suspiró Beatriz. —Este último rato ha estado muy tranquila… no lloró ni nada —sonrió Jorge. Su esposa desapareció en el dormitorio mientras él guardaba las cosas sueltas en una mochila pequeña, que cargaría Beatriz. Se colocó el martillo a la cintura. Realmente, no se sabía capaz de esgrimirlo para defenderse, pero el llevarlo le daba cierta seguridad. El martillo resbaló desde la cintura y golpeó sordamente sobre el piso de cal. El grito, desgarrado y agudo, se sostuvo por espacio de diez largos segundos. Cuando se interrumpió, Jorge reaccionó corriendo hasta el dormitorio. Beatriz estaba de rodillas en el piso, la boca abierta, los ojos fuera de sus órbitas. Permanecía en un grito sin sonido, la garganta muerta, la voz helada. Delante de ella, la cuna estaba vacía. —¿Dónde está? —chilló Jorge. Pero Beatriz solo se mecía para atrás y para adelante, petrificada y muda. Jorge avanzó, vacilante, por el cuarto cerrado. No había suficiente espacio como para no ver a la bebé. No había lugar donde permaneciera oculta. —¿Betty? —tartamudeó Jorge, sintiendo que le fallaban las piernas. —Mi bebé… —murmuró Beatriz a sus espaldas—. ¡Mi bebé! ¡Mi bebé! ¡Mi bebé! Sus gritos se hicieron cada vez más fuertes, las palabras perdieron contenido y solo fue un grito gutural, primario. Jorge no lo resistió. Se agarró la cabeza con las manos y salió, tapándose los oídos. Corrió hasta que la arena le llegó a las rodillas. Allí se dejó caer bajo el sol, la casa pequeña y desvalida detrás de él. Las lozas rojas del patio. El sendero también rojo que debía haber llegado alguna vez hasta la carretera. Donde alguna vez hubo algún regreso hasta la civilización. El tejado de zinc. El piso de cal. Las ventanas sin cristales, solo cubiertas por descascarados postigos de madera. La casa vacía. Beatriz había dejado de gritar. Cada grano de arena es diferente pero igual a la vez. Uno y otro se vuelven idénticos, pero se saben distintos. Sus tamaños, formas, incluso sus contenidos, pueden ser los mismos, pero íntimamente cada uno de ellos se sabe un individuo. Se sabe, sin embargo, parte de algo. Diferente, pero lo mismo. La cara de Jorge se hundía en la arena. Tirado cuan largo era, se sentía hundirse lentamente, casi imperceptiblemente, en ese mar amarillo, donde el sol refractaba como si iluminara cristales. Sus manos, abiertas, las palmas sobre el suelo caliente. Su cuerpo, aplastado por la presión y la culpa. Los ojos, ya secos y sin lágrimas. Su mente vacía. Comenzó a arrastrarse nuevamente. No sabía adónde ni por qué continuaba. Solo le quedaba un reflejo elemental de continuar adelante, siempre adelante. Un hilo de saliva se escapaba por la comisura de sus labios y se confundía con la arena. La boca, abierta y jadeante, había perdido para siempre la capacidad de articular palabra alguna. No se sorprendió al descubrir las sombras sobre su cuerpo. Eclipsando por momentos el permanente sol, los buitres sobrevolaban su presa. Esta aún se movía, y ellos no eran estúpidos. Si la presa se mueve, todavía puede defenderse. Ellos no cazan. Solo aprovechan lo que queda. Jorge giró sobre sí mismo y quedó boca arriba. Los vio girar, realizar arcos en el aire, incomprensibles. Los escuchó graznar en su idioma, más antiguo que la palabra y la forma. Carente de contenido, pero que significaba todo. Los miró durante segundos, minutos, horas quizás. Pacientes, su número cada vez mayor. Hasta cubrir todo el cielo. Un grito sordo, apenas humano. Un desesperado aullido de pena y dolor en el silencio del desierto. La desesperación hecha sonido. Los buitres se dejaron caer uno tras otro sobre su presa. Rodolfo Santullo (Uruguay-México, 1979). Rodolfo Santullo has published *Perro Come Perro* (a collection of short stories, Artefato 2006), *Las otras caras del verano* (a novel, Amuleto 2008, in collaboration with Martín Bentancor), *Cementerio Norte* (a novel, Trilce 2009), *Sobres Papel Manila* (a novel, Estuario 2010) and *Aquel Viejo Tango* (a novel, Estuario 2011, in collaboration with Martín Bentancor). He has also written the graphic novels *Los Últimos días del Graf Spee* (2008), *Acto de Guerra* and *Dengue,* with a prologue by Ian Watson. Will Carne is a freelance translator specialising in literature and academia. He graduated from from Trinity College, Dublin in 2011 with a double first in Hispanic and Italian Studies. December 7, 2016 | Filed under Rodolfo Santullo, Will Carne and tagged with Rodolfo Santullo.